Never forget where you came from. Celebrities, musicians and the wealthy alike have carved out an image in pop culture of a certain lifestyle that many of us aspire to. Part of that image is the large, well equipped comfortable and indeed, baller, luxury SUV. For the longest time, the mac daddy of that scene was the Cadillac Escalade. But these days you’ve got competition from even unexpected brands like Bentley and Rolls Royce. But they all arguably owe it all to the original Lincoln Navigator. Now in its fourth generation, the Navigator has been completely refreshed. It still has that air of old world luxury, but is decidedly modern. Let’s find out if Lincoln’s Navigator can get back to the height of its glory. In a large SUV like this, you might expect an equally large engine, as history – and the competition - dictates. But the new Navigator is ditching V8 altogether. Instead, you’ll get the twin-turbocharged 3.5L EcoBoost V6 Ford uses in their hot F-150 Raptor. It’ll also be paired with Ford’s slick 10-speed automatic. It’s a potent engine, making 450 horsepower, but in the Lincoln, it feels butter smooth. The engine excels at low end grunt, getting you moving in a fast, refined and surprisingly quiet manner. The exhaust note is very subdued, even at highway speed. The massive Lincoln does a good job at keeping the vehicle stable in corners. It feels somewhat disconnected, which, for an SUV like this, is ideal. This isn’t a Lamborghini Urus after all. It does have good power, and a ‘sporty’ driving mode, but the Lincoln is a luxury vehicle first and foremost. Sporting an unmistakably Lincoln design on the outside, the new Navigator looks like a natural evolution of the previous generations. It’s large and imposing, especially in our extended wheelbase tester, but still elegant. But despite it being physically larger than the outgoing Navigator, it ends up being nearly 90 kilograms/200 pounds lighter. If the design didn’t give away the fact that it’s a Lincoln, the chrome grille up front (complete with illuminated badge) and the light bar in the rear will. 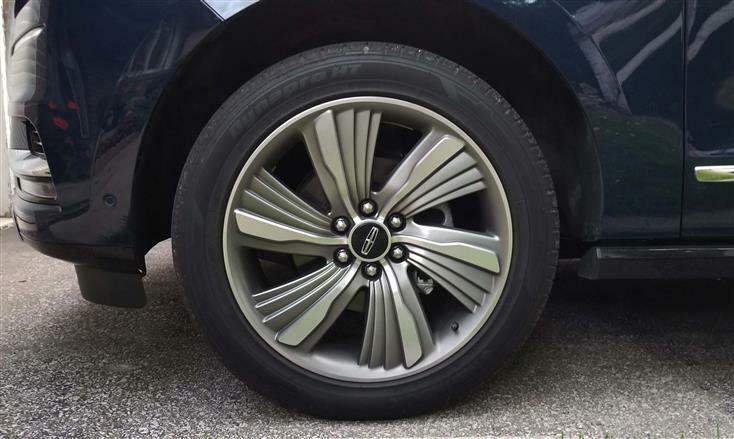 Our tester rode on some massive 22-inch alloys, which just add to the imposing nature of the SUV. Despite their size, the ride is still quite comfortable. Inside, the new Navigator boasts premium materials and comfort galore. The driver’s seat can be adjusted a staggering 30 ways. It’s well worth it to take the time to find the positioning that’s just right for you. It’s easily one of the most comfortable car seats you can buy. Like the new Continental (reviewed here), the transmission is relegated to a series of push buttons next to the easy to use infotainment system. You’ll also find some extra luxuries like a 4G LTE hotspot and screens for second row passengers. Third row passengers get the least luxury, but they can still recline their seats at least. Headroom in the back can be an issue for taller passengers but the large amount of recline on both 2nd and 3rd row seats can help alleviate that. Still, for such a large vehicle, we wouldn’t have expected this to be an issue. The new Navi’s dashboard might be a little intimidating for certain demographics, but is easy to…navigate…after familiarizing yourself with it. The reconfigurable display gauges will show off some nice animations as you go between the various driving modes including Conserve, Excite (sportier driving), Normal, Slippery and Deep Conditions (for snow and mud.) We kept the car in Normal for the most part. From adjustable gas and brake pedals, premium audio, leather seating and satellite navigation, the original Navigator paved the way for the luxury SUV in North America. Its high price tag and numerous celebrity owners, references in songs and pop culture gave it an air of exclusivity. But over the years, the Navigator fell victim to its success. As other manufacturers took note of the formula, they too capitalized on the market, pushing the Navigator to the sides. But with the new Navigator, Lincoln got the formula right. Chevrolet Finding Ways to Make Cars Slipperier!